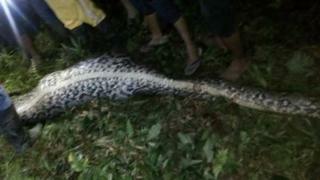 A missing Indonesian man was found dead inside the body of a python, according to local police. Akbar went missing on Sunday on the island of Sulawesi, after leaving to harvest palm oil. In the search for the 25-year-old, police told BBC Indonesian that they had found a huge snake they suspected had swallowed the man. The reticulated python, reported to be 7m (23ft)-long, was cut open and the man's body was found. Video shot by police showed the snake being cut open with a long knife, slowly revealing the man's clothed body. How can a snake eat a human? Reticulated pythons are among the world's longest reptiles and suffocate their victims before swallowing them whole. Pythons rarely kill and eat humans, although there are occasional reports of them swallowing young children or animals. Mashura, a spokesperson for the police in West Sulawesi province told BBC Indonesian that villagers reported to police that Akbar had been missing for 24 hours. Police then conducted a search and found the snake near the family's palm plantation. "They didn't find him (Akbar), but the villagers saw an unmoving python in the ditch. They grew suspicious that maybe the snake had Akbar. When they cut it open, Akbar was inside the snake," Mashura, who like many Indonesians goes by one name, said. Village secretary Salubiro Junaidi told The Jakarta Post: "People had heard cries from the palm grove the night before Akbar was found in the snake's stomach. "Resident[s] cut open the belly of the snake and Akbar was lifeless." Nia Kurniawan, from Brawijaya University, told BBC Indonesian that a python of this size would hunt for large prey, such as boars or wild dogs. While they normally avoid human settlements, they would see palm oil plantations as a good hunting ground, he said, as they attract animals like boars, primates or dogs. What were the legendary man-eating snakes of Borneo?